Love this! It reminds me of the cranberry sauce my Oma used to make. She added pears to hers too. 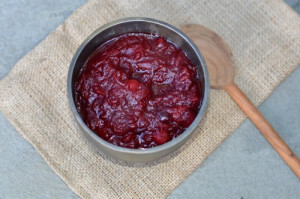 As a recent convert to cranberry sauces from scratch, your recipe is a stand out. It’s a hearty relish that makes a great side any time of the year. Brilliant idea to use Cranberry juice in place of water. I must confess that I had to substitute port wine for the apple brandy as I didn’t have any on hand, but I don’t think it took away from the flavor. Thanks for adding to our delicious meal of Cornish hens. Best wishes to you and all the staff at Entertaining by the Bay.